These are the workshops and lectures Marlene does on a regular basis. Contact her to schedule one for your group. upcoming workshops, shows and lectures. Class Description — Make your own designer silk scarves with easy and neat instant-setting dyes. Learn casual Shibori (scrunch dye) techniques (without tying or major preparations) to make sunset lines or zebra stripes, soft or dynamic floral images and little window shapes. 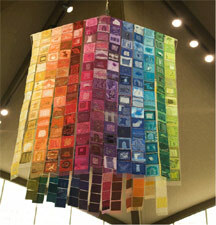 Create a silk scarf, a hand-dyed silk organza greeting card and stencil-dye some silk broadcloth. It feels and sews like cotton, but is 100% silk. So, it takes the instant setting dyes easily, with no heat-setting needed. Feedback from my "Make it and Take it"
"Thank you. 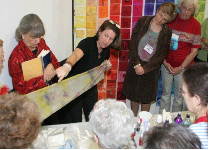 Once again your hand dyed scarf demo was a HUGE success! You are a pleasure to work with and the patrons loved the experience. Your support of Florida Craftsmen and [the] Craft Art [show] are truly appreciated." Class Description — Explore the basics of learning to apply color to silk with instant setting dyes. You will be amazed at how easy it to create designs on luxurious silk fabrics ending in an array of accessories — a silk pouch, a cosmetic bag, a designer shawl, a sheer gift bag and a silk greeting card. Techniques include dyeing in a baggie, spray dyeing and using resists for stained glass effects. "I would like to thank you again for the opportunity to take the silk dying class. I have been raving about it. Thank you. It was wonderful. You are so patient and thorough - great teacher attributes! You are patient, organized, thorough and creative. I was amazed at the complete folder full of samples, order forms for supplies and information that accompanied the class. I look forward to your next workshop!" Class Description — Explore personal design ideas using monochromatic colors in a small format along with adding 3D effects (floral sheers, embellishments, dimensional fabric). "The workshop you gave was wonderful. I have a great deal of awe for your planning, organization and the materials you arranged and gave us to work with...so thorough and generous. "I made 7 [collages] from the materials in yellow. What I saw is that in addition to these techniques and skills, you have a great deal of knowledge and sense of the colors and how they live with each of them. Yellow was a challenge and yet, since each color has a value, there must be a challenge in each of them. 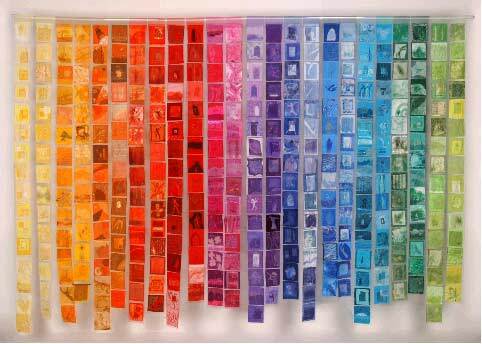 "Something wonderful happens when you enter the color itself and you have a great deal to share on this I am sure." Class Description — Quickly and rapidly make narrow, fluffy scarves or belts using just four fingers, one strand of plain yarn and one strand of eyelash (or fluffy) yarn. This technique is faster than knitting. I learned it from one of my 3rd grade art students! Class Description — Walk through a new doorway and experiment making your own fabric with doorway images using plastic doilies, paper or plastic shapes, spray colors, silk fabric and instant setting dyes. Sooooooooo EASY! © 2007-2012 Marlene Glickman All Rights Reserved.